Whey protein is a protein powder which is made by dehydrating ‘whey’. And whey is simply the liquid product that is left over when you make cheese from cow’s milk. Simple as that. And What On Earth Are “Activated” Nuts? Activated nuts are nuts which have been soaked in just water or salted water for a long time, about 7 to 12 hours. Remember, nuts are really just the seed of that particular tree. Just like any seed they contain substances to stop the seed sprouting too early. Soaking reduces the phytate level in the nuts (i.e. phytic acid), which is really just starting off the sprouting process. The nuts are then typically dehydrated again so they are crunchy again and store well. Phytates are substances that bind to calcium, iron and zinc, which decreases their absorption. As a result, activating nuts before you eat them aids better absorption of these nutrients, and makes your nuts healthier to eat. If you’re low on iron it may not be that you aren’t eating enough iron rich foods – it could simply be that you’re not absorbing it well enough! How Do Whey Protein & Nuts Compare Nutritionally? Well, one pouch (43g) of whey can come in at 170 calories, 30g of protein, 1.0g of fiber, and only 2.5g of fat. Additionally, it provides 20% of your calcium needs, which is important for bone health. A 30g serving of almonds (about 28 almonds), comes in at 161 calories, 6g of protein, 3.4g of fiber and 13.8g of fat. Most of the fat provided is the heart-healthy fat though. In addition, it provides 37% of your Vitamin E needs and is a good source of magnesium, phosphorus and manganese, which are all important for bone health. “Activated” nuts contain the same amount of nutrients as “regular” nuts. However, since there are less phytates in them, your body is better able to absorb the calcium, iron and zinc. OK … nuts are great for me, but what I am really interested in is a low fat high protein source for my workouts. Can you break down how they compare? There is no comparison really. Whey wins. 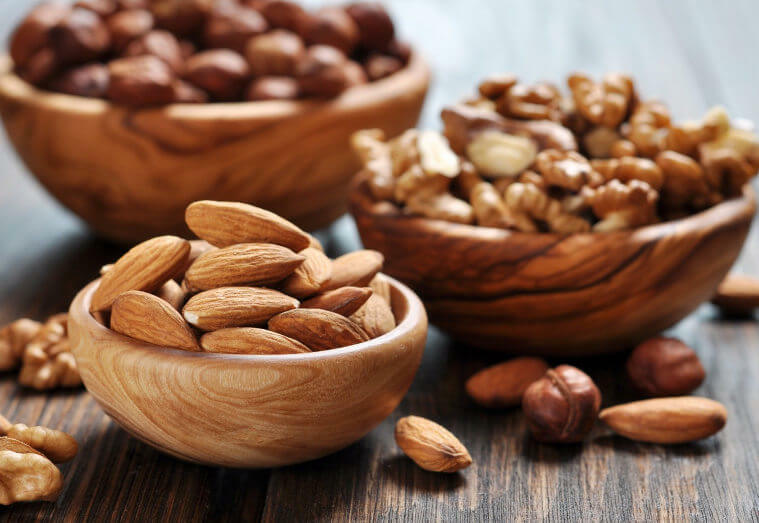 Taking our example above, you would need to eat 140 almonds to get as much protein as one pouch of whey. In the process (if you are able to eat 140 almonds in one sitting! ), you would pack in a ton of extra calories and fat. You would eat a whopping 805 calories and 69 grams of fat (exceeding your fat needs for the entire day)! The building of muscle protein depends on the type of protein eaten and physical activity, especially resistance training. Supplementing with extra protein before and especially after exercise has clearly been shown to bulk up muscles. Typically 1.4 grams of protein per kilogram of bodyweight is recommended per day for optimum results. So if you weigh 60kg then 84g of protein. However, not all proteins are created equal. Protein quality plays a huge role in muscle growth and gain. High quality proteins supply enough of all the essential amino acids (building blocks of protein) needed for muscle growth. Lower quality proteins do not. There are two main factors which determine protein quality. These are digestibility and amino acid make up. What is digestibility? This is how well a protein is digested. This is determined by the source of protein and the foods eaten along with it. The digestibility of most animal protein is very high (90 to 99 percent). The digestibility of most plants are lower (70 to 90 percent for most, but over 90 percent for soy and legumes). What is amino acid make up? This is the amino acid content of a protein. To make a protein, the body needs to have every necessary amino acid available. A common term for necessary amino acids is essential amino acids. If the body is missing an essential amino acid, the body must break down its own protein to get it. In order to prevent this muscle loss, the protein we eat must provide all the essential amino acids. Which Protein Is Higher Quality? Whey protein is higher quality as it is an animal protein, and it contains all the essential amino acids. Nuts are lower quality as they are a plant based protein and they lack at least one or more essential amino acids. Recent research suggests that consuming soy and wheat plant based proteins results in a lower rate of protein synthesis compared to whey. Unfortunately, nuts have not been studied to the same degree yet. The lower rate of protein synthesis may be due to lack of certain necessary amino acids. Also most plants have a lower leucine content. Leucine is an amino acid known to trigger muscle growth. Some studies also show that whey may improve recovery following heavy exercise, and possibly reduce muscle damage and soreness. So Which Is The Clear Winner? Whey! 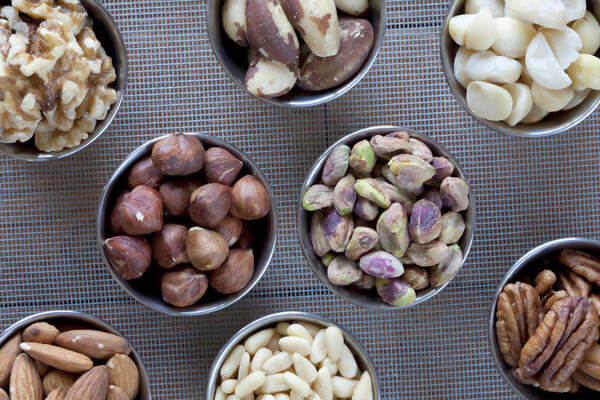 Nuts are great as part of your daily diet, given their heart-boosting and bone-building nutrients. However, as a low fat, high protein source they are impractical for your post workout supplementation. They would have to be combined with low fat, high quality protein food sources to provide similar benefits as whey protein. In addition, supplementation with leucine would be needed to offer the same muscle growth qualities as whey.